For some years research teams have explored and attempted to sort out any evidence concerning a cause-effect situation with mobile phones and cancer. Interest in the question does not disappear. Scientific groups prefer to welcome more studies than to shoo the question away. Any talk, however, about those who suspect cell phones as cancer risks and those who dismiss the fears as rubbish is incomplete without looking at a group in the middle, who in the absence of a pure yes or no prefer to continue studying the question about any health risks. Shaking things up to an extent, in 2011 the World Health Organization's International Agency for Research on Cancer (IARC) classified radiofrequency electromagnetic fields as possibly carcinogenic to humans (Group 2B). The category is used when a causal association is considered credible but chance, bias or confounding elements cannot be ruled out with reasonable confidence. In other words, such factors as biases, confounders and errors take away from the strength of the conclusions. A fact sheet from WHO dated 2014 said, "The electromagnetic fields produced by mobile phones are classified by the International Agency for Research on Cancer as possibly carcinogenic to humans." 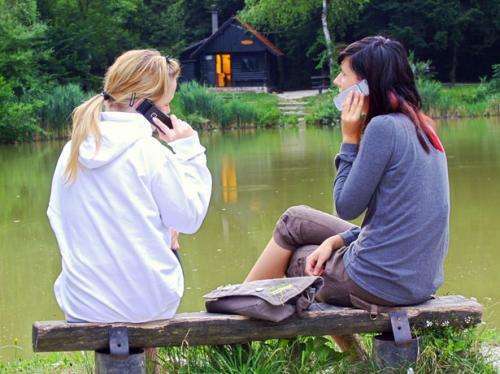 "Federal scientists released partial findings Friday from a $25 million animal study that tested the possibility of links between cancer and chronic exposure to the type of radiation emitted from cell phones and wireless devices." This was how reporter Ryan Knutson of The Wall Street Journal summarized news of the study. "The multiyear, peer-reviewed study, by the National Toxicology Program, found 'low incidences' of two types of tumors in male rats that were exposed to the type of radio frequencies that are commonly emitted by cellphones. The tumors were gliomas, which are in the glial cells of the brain, and schwannomas of the heart." The National Toxicology Program is under the National Institutes of Health; it is an interagency program and it led the study. NTP's stated goal: safeguarding the public by identifying substances in the environment that may affect human health. So is there a relationship between exposure to radiofrequency radiation and tumor formation in rats? The research was performed on male rats, with experiments on multiple groups of 90 rats, said Scientific American; rats were exposed to radio-frequency radiation at 900 megahertz. According to the Scientific American report, the study chronicled rodents subjected to a lifetime of electromagnetic radiation starting in utero. The animals exposed to RF had a greater chance of being diagnosed with malignant glioma type of brain cancer, as well as developing a tumor found on the heart. "The incidence grew with greater levels of exposure to the radiation. Some of the rats had glioma—a tumor of the glial cells in the brain —or schwannoma of the heart," said Maron. The rats were exposed to "carefully calibrated radiofrequency (RF) radiation levels designed to roughly emulate what humans with heavy cell phone use or exposure could theoretically experience in their daily lives," said Maron. Exposure involved their whole bodies with radiation for approximately nine hours per day throughout their two-year lifespans, she added. Why nobody wants to walk away from the question any time soon—Scientific American's report said that "More than 90 percent of American adults use cell phones. However, relatively little is known about their safety because current exposure guidelines are based largely on knowledge about acute injury from thermal effects, not long-term, low-level exposure." No, the study is not likely to end the discussions. The study is, however, likely to keep the curiosity fire burning. According to the Environmental Working Group: "David Carpenter, director of the School of Public Health at State University of New York at Albany, who has followed the issue closely, said the study 'won't end the debate, but I can't imagine anything with more credibility than an NTP report.'" Carpenter also said he thought the report could spur other health organizations to take a fresh look at the issue. Dina Fine Maron had her assessment, saying it was "the strongest evidence to date that such exposure is associated with the formation of rare cancers in at least two cell types in the brains and hearts of rats." It should be noted that the NTP report is on partial findings, limited to select findings of concern in the brain and heart. The study said that it does not represent a complete reporting of all findings from these studies of cell phone RFR. Complete results for NTP studies on the toxicity and carcinogenicity of GSM and CDMA modulated RFR are being reviewed and will be reported with current findings later on. Draft NTP Technical Reports are expected to be available for peer review and public comment later next year. There is not much cell phone traffic on 800 to 900 MHz any more. Most of it has moved up to 1700 to 2100 MHz. Wouldn't the dimensions of the test subject and their internal organs have bearings on the analogous effects in humans of electromagnetic radiation? A half wavelength at that frequency is about the length of a rat. I would imaging then, a rat would have pretty good energy absorption at 900 MHz. That is a LOT of RF power. I'm actually a bit surprised the effects weren't stronger. Surely warming tissue continuously is expected to have health effects? In the US, cellular band is still quite heavily used, alongside PCS. All major carriers are using those bands for their respective choices of GSM, UMTS or CDMA technologies. AWS has only really began to grow significantly in the past 5 years, give or take, with the advent and adoption of LTE. "That is a LOT of RF power. I'm actually a bit surprised the effects weren't stronger. Surely warming tissue continuously is expected to have health effects?" THat's usually the problem with these studies. Even their lowest exposure level is three times the normal exposure from a cellphone held up to your head. The idea being of course that they need to give the rats a radiation energy dose proportional to what humans would recieve during a lifetime, but, the rate of the dose is ridiculously high. It's like simulating the effect of touching your forehead every day for 75 years on a rat by touching their forehead every day for 2 years with 37.5 times the force - basically punching the rat in the face once a day. The rat gets hurt - surprise surprise. They basically put the rats into a low-level microwave oven/sauna and were able to find that additional physical stress increases the chance of cancer, which is already known. This prove that everything is possible. Just knowing basic physics & biology don't make us able to predict something is safe or not. Biology is a complex machine. For comparison, 6 Watts per kg body mass of incoming energy on the whole body of an average human would mean 450 Watts extra, while the normal metabolism is responsible for about 100 Watts. So the experimenters basically induced a permanent fever on the mice. Ever since 2007 researchers have already linked RF to changes in proteins expression inside your cell. Which is what happens at elevated body temperatures. Any proof that fever cause cancer? Persistent stress and inflammation does. Elevated body temperatures for the entire life of the animal is exactly the kind of persistent stress. ATF3 is activated when all types of cells experience stressful conditions that threaten their ability to maintain a constant internal environment (homeostasis). Under normal circumstances, triggering ATF3 protects the body from harm by causing normal cells to commit suicide if there is a risk they have become permanently damaged by the stressful conditions (eg lack of oxygen or irradiation). When cancer cells first arise, the immune system recognizes them as foreign agents and enlists immune cells to attack them. cancer cells are able to switch on ATF3 in immune cells that have been summoned to tumor sites. Increased physical stress triggers the ATF3 more easily, which helps the cancer cells to survive. The point of cancer is that you have millions and millions of cells "going wrong" in the body all the time. There are multiple layers of error correction and self-destruction mechanisms that prevent living cells from turning into cancer. Every human cell after all is a semi-independent microbe that could break the ranks and start going solo like the HeLa cell culture. A whole lot has to go wrong to turn a cell into cancer, and even then the cancerous cells are usually destroyed unless they undergo yet more mutations that allow them to dodge the immune system, or to simply multiply successfully without breaking down. So it's a game of chances. One person won't win the lottery, but a million people will sometimes. That's why so many things "cause" cancer - because they influence the odds by which the cancer cells mutate or survive. Even being in a lousy mood increases your lifetime chances of cancer by putting your immune system down - slightly.